Winds of Change by Rinie van Est is a masterly work of meticulous research that could well become a classic in its field. It should be required reading for all energy planners, and energy industry leaders alike. Rinie van Est, both a physicist and political scientist, specializes in the field of innovation and technological diffusion. He works for the Rathenau Institute, the Dutch parliamentary technology assessment organization. I've been long remiss in posting even a brief review of Rinie's book, his doctoral thesis on how and why small Danish farm implement manufacturers outproduced the giants of the aerospace industry in developing wind turbines. It was Rinie that introduced me to Steven Borish's book, Land of the Living, as well as Den Internationale Højskøle in Helsingør where he studied Danish. I relied heavily on Rinie's work and that of Peter Karnøe in the chapters of my book Wind Energy Comes of Age dealing with the rise of Danish wind turbine manufacturers and the failure of the expensive U.S., German, British, and Swedish wind energy programs. The success of grassroots or bottom-up technology development and the failure of top-down or centrally directed research and development is all documented between the two covers of Winds of Change. 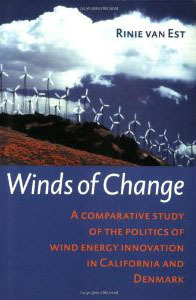 Winds of Change: A comparative study of the politics of wind energy innovation in California and Denmark by Rinie van Est, ISBN 90 5727 027 7, paper, 364 pages, US$29.95, 1999. Available from Amazon.com. 1.1 Why Wind Energy Innovation?